Fantasy is a manifestation of our dreams and desires, a cathartic escape from our lived contemporary reality, an imagined alternate universe, and an application of creative imagination onto our surroundings and lives. It is the improbable and the unreal, the supernatural, the speculative, and the unknown. Fantasy cannot exist without reality; our understanding of real space cannot be limited solely to our pragmatic observations of the known. You cannot have ‘the real’ without the fanciful caprices that assume our thoughts, you cannot have the magical and fantastic without the struggles, banalities, and problems of lived actuality -- they are twin forces that construct our very understanding, mobility, and psychology in our lives. The five artists included in this fifth issue of Work in Progress all engage with notions of fantasy, magic, and alternate reality in varying degrees as a subject, a lens, or a constructed byproduct of image making. Fantasy and science fiction scenes are the subjects of Clark Filio’s figurative paintings, which draw from and reference popular culture source material (TV shows, video games, films, etc.) or are constructed from Filio’s own imagination but stylized and informed by these same elements. Filio’s work forces viewers to question what it means to translate images that are mass-produced and consumed for the purposes of entertainment into oil paint, and ask how images of fantasy and science fiction can be interpreted and understood. His attention both to subject and material practice allow his works to raise larger and more existential questions about our contemporary reality and representations of narrative and storytelling. Timothy Hoyt’s paintings depict narrative scenes of mythology and fantasy. While much of his work draws from ancient Greco-Roman myths, his more recent pieces build upon these themes by constructing narratives that participate in a larger project of world building and utilize our current political reality and socio-cultural events as the inspiration for these fantastical scenes of drama, betrayal, horror, and revelation. His work uses fantasy and practices of creating an imaginary world, referencing video game or scifi/fantasy constructions found in literature, comics, TV, and movies, as a lens to examine what is happening in our own socio-political moment. 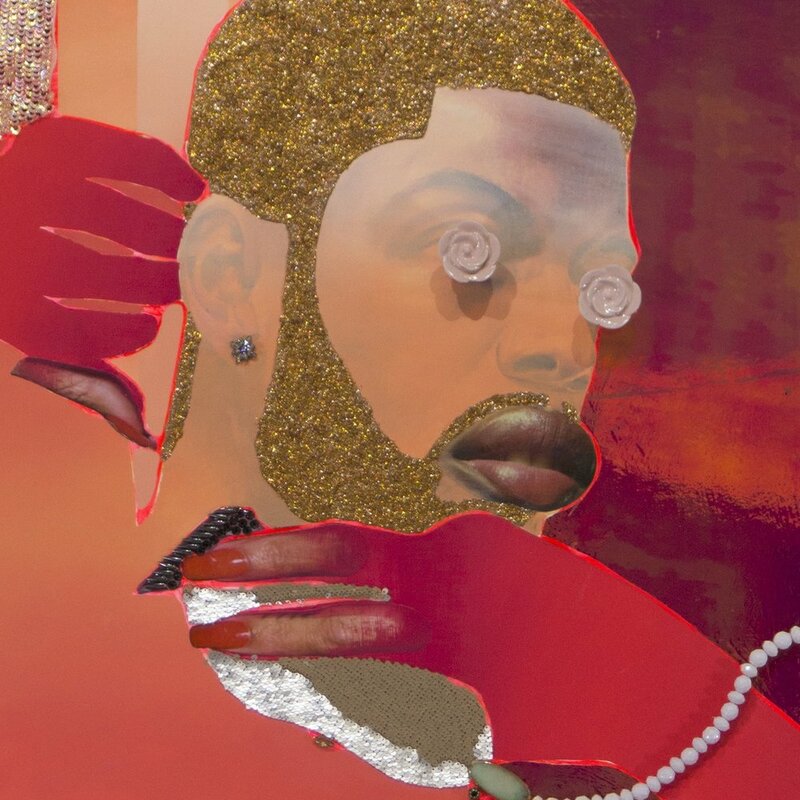 In Devan Shimoyama’s paintings, magic and myth operate not as obvious subjects, but more as elements that aid in the exploration of emotional and personal experiences and constructions of identity and community. Shimoyama’s material choices operate as subjects themselves within his works and embody physical representations of magic, which amplify the experiences, emotions, and struggles of his subjects. They obscure the reality of Shimoyama’s scenes by amplifying an emotional fantasy that is both celebratory and discerning, revealing darker truths regarding constructions of identity and socio-cultural experiences of sexuality, race, and gender. In a similar way, Hiba Schahbaz’s works incorporate magical realism into the narratives of her paintings. Trained in traditional Indo-Persian miniature painting, where the painting is meant to represent reality but not be representational, Schahbaz expands this visual language of miniature into works where her own figure operates as a subject, and traditional narratives and representations of femininity, female identity, and the female experience are challenged. Washes of color, wisps of smoke, fantastic landscapes, or undulating colors embellish her scenes, allowing these magically realized works to operate beyond their literal imagining. In Royal Jarmon’s works, fantasy operates less in a literal way, and instead creates an alternate view of reality. His pieces construct a new way of viewing and perceiving our surroundings, the culture around us, and the personal experiences and constructions of individuals and societies through exaggerated perspectives, saturated colors, and distortions in shape or form. Humor threads through his paintings and sculptures, and his pieces seem almost like explosions of a particular and singular moment or sensation that is amplified in the way reality is magically abstracted and rendered. Collectively, the artists and works presented here question our perceptions and understandings of reality and the dividing line that we draw between what is real and what is imaginary. While most frequently viewed in opposition, fantasy and reality here become blurred and married subjects whose relationships and differences become harder to discern the more you try to distinguish and separate them. Many thanks to Clark, Tim, Devan, Hiba, and Royal for participating in this issue of WIP.